And here it is - Included with the Gotek package (as above) is the Gotek board mounted in a floppy drive sized plastic case (with controls, USB port and display mounted at one end), 8GB USB flash drive, engraved with the Amiga logo, DVD with goodies, Instructions, USB flashing tool and cable for upgrading the Gotek firmware from a Windows PC and some jumpers and mounting screws. It was very cheap compared to the HxC, only AUD$60. But keep in mind it does less too (more on that later). The case is designed to be the same size as the floppy drive you are expected to remove to install this into your Amiga case. It also has screw holes in the right places for the mounting points into the Amiga 600. The slot number assigned matches up to the 3 digit number displayed on the Gotek case. You can mount up to 999 ADF files with the Gotek. You can press down both buttons on the Gotek to quickly change the display to 000 to boot the SELECTOR.ADF again. It does work well, but unfortunately it doesn't suit my needs really. 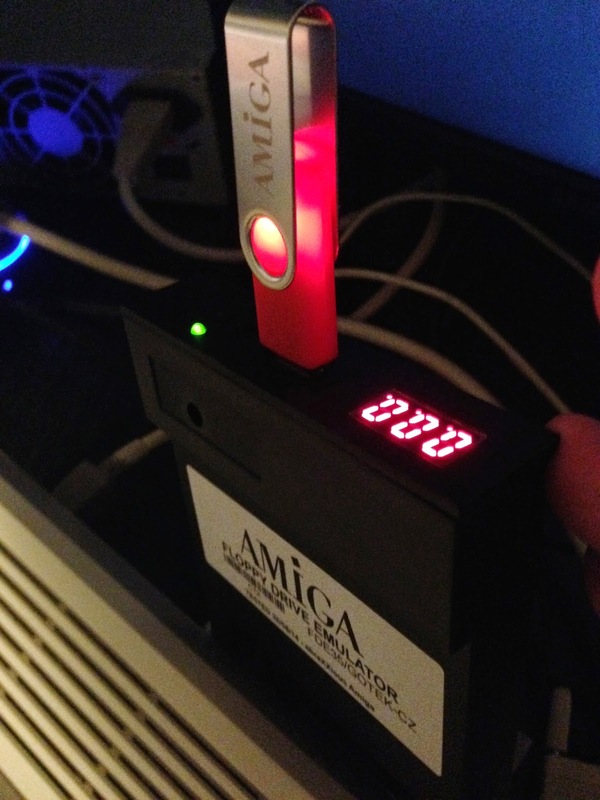 I think this device is really intended to 100% replace an Amiga floppy drive on an unexpanded Amiga 500/600/1200. I should mention I have seen an external floppy drive mounting kit which I assume means the Gotek can be made to boot from the external drive if you run an Amiga with Workbench 3.0+ ROMS. This would avoid hacking up the original case. However, many games expect to be DF0 and will not work in this configuration, limiting it's usefulness. 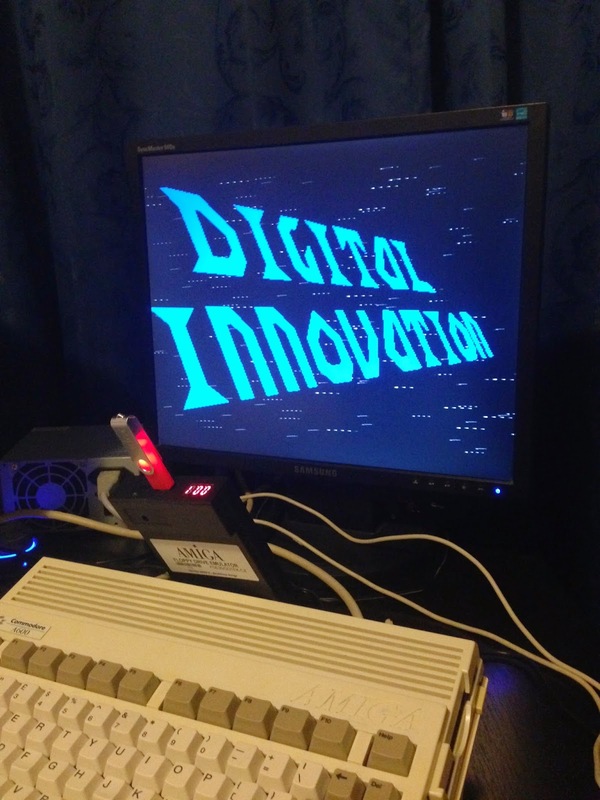 The ACA630 accelerator in the Amiga 600 allows me to reconfigure the floppy drive assigns so that DF1 is actually DF0 in hardware, which bypasses this problem above! 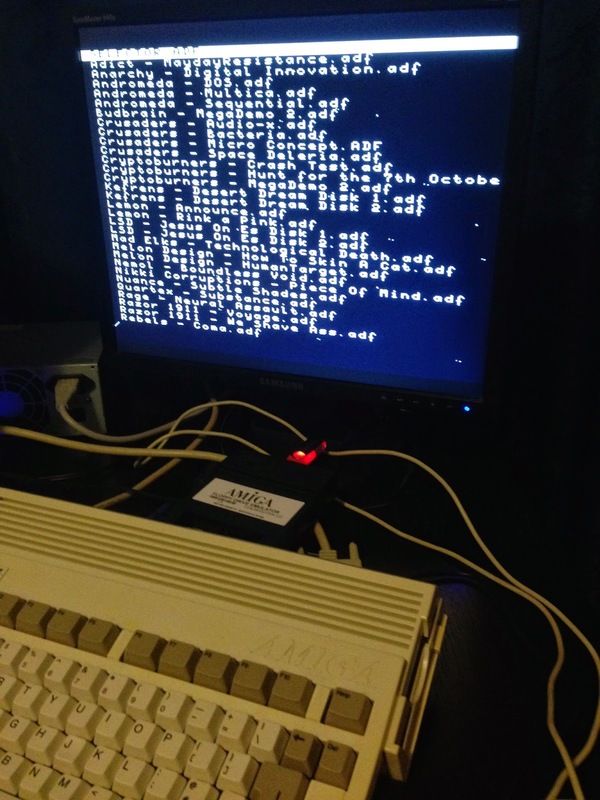 The Gotek does not support IPF files, which means it cannot replace protected floppy disks (games, mostly). For me, this means it cannot be a true floppy drive replacement - you still need the floppy drive to boot protected floppies in your collection. For people without a large collection of original game floppy disks this would not be an issue - I bought most of my games so it is for me. Perhaps this IPF support will come in time. 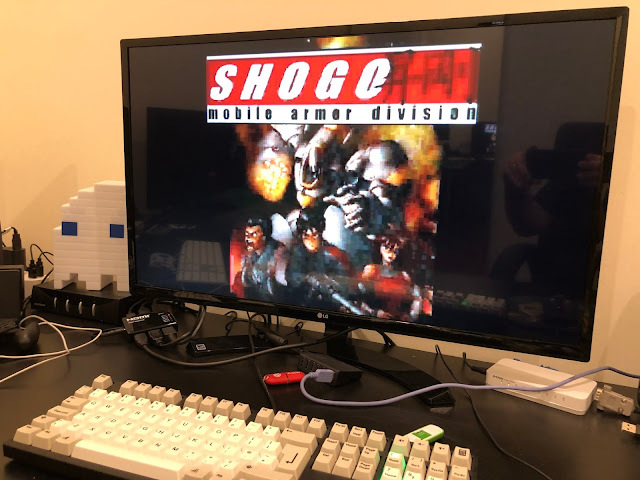 On the other side of the fence, the HxC floppy drive emulator supports ADF and IPF files amongst others, and has a nicer application to select files and mount them/reboot too - it also has a nice big display to show the active ADF to make switching ADF's easier without the selector application. 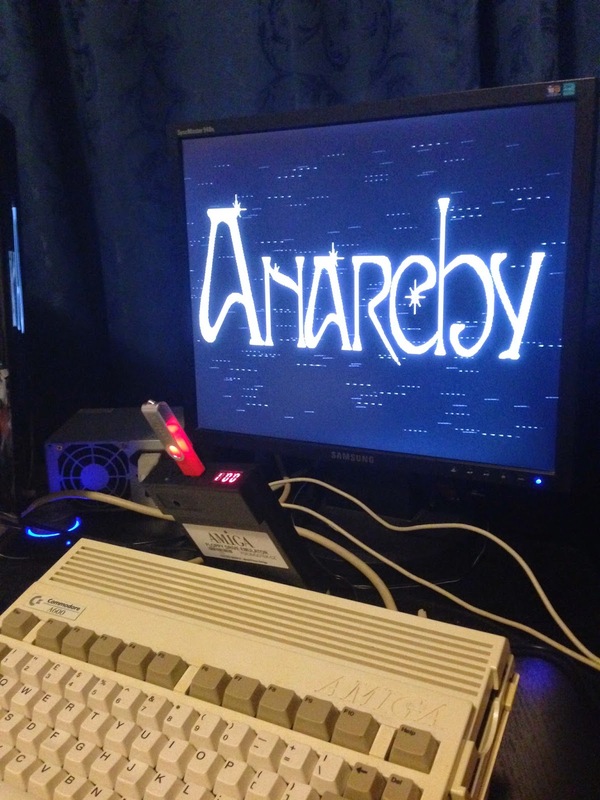 However, installing it as a floppy drive replacement also involves modifying the Amiga case. Going back to the Gotek - Changing SLOTS is fiddly and slow - the selector application requires you to take a photo of the screen showing what ADF you assigned to which SLOT as you have zero chance of remembering this later on when selected the SLOTS using the buttons - there is no other display. This also means you are likely to need to modify the SLOT list often to keep the number of active ADF files low, so that you don't have to press the button so many times....this also means taking photos regularly when you change it..and don't forgot to Save before rebooting from the SELECTOR.ADF each time! 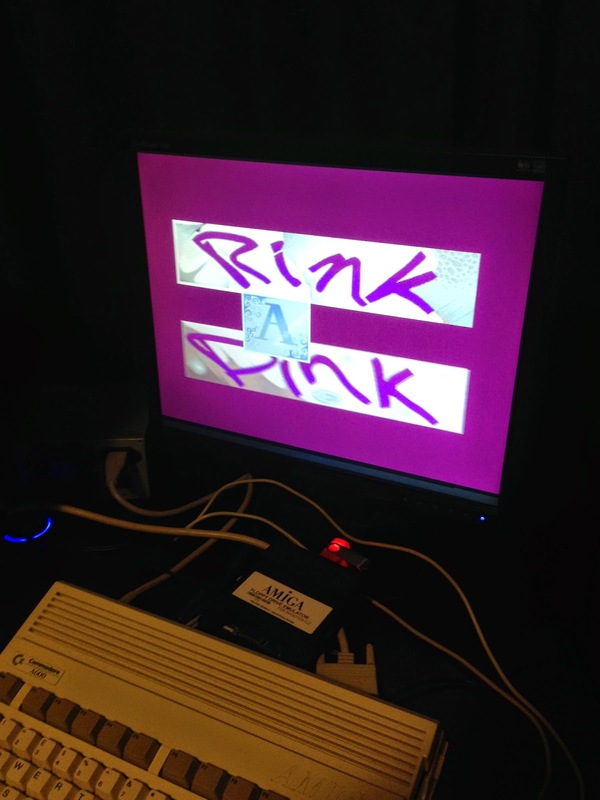 Multiple floppy disks being changed is also a little bit fiddly due to the digit display location, and important to assign the multiple disks to sequential SLOT numbers to avoid slowness switching disks. I will gloss over the DVD filled with "all the ADF's and DMS files you will ever need" included with the package - do with this what you will. 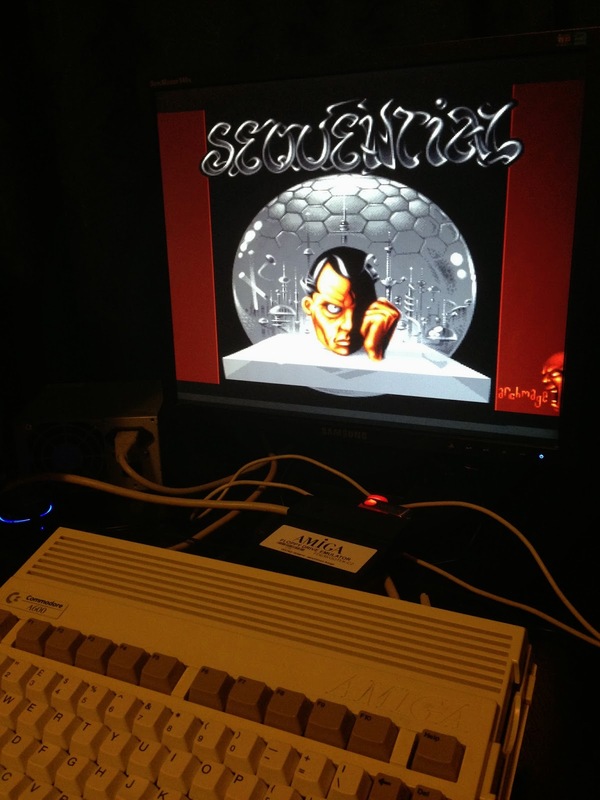 Not totally convinced the seller has a license to use the Amiga name and logo, or permission for the re-flashing of the Gotek for Amiga support either, but maybe the seller does - I'll give them the benefit of the doubt here. 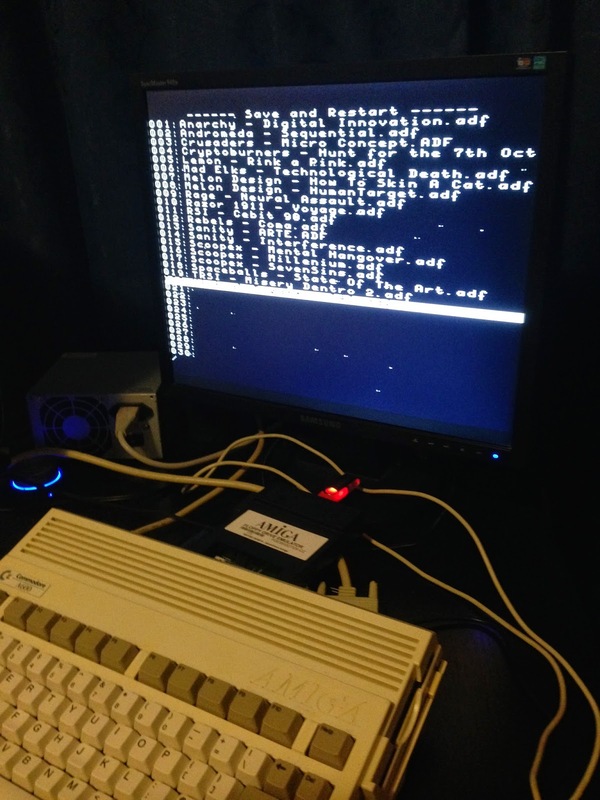 It sounds like I am being a bit harsh on the Gotek, but in summary it is a workable solution for booting ADF files on a real Amiga, with some caveats. 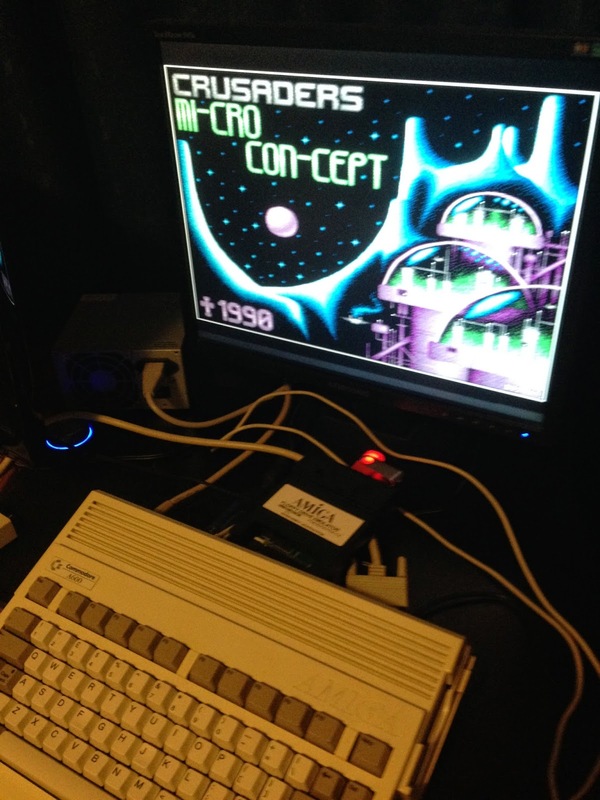 I am grateful to have the Gotek flashed with the Amiga floppy firmware with everything you need to plug it in and get started, and the price is certainly attractive. 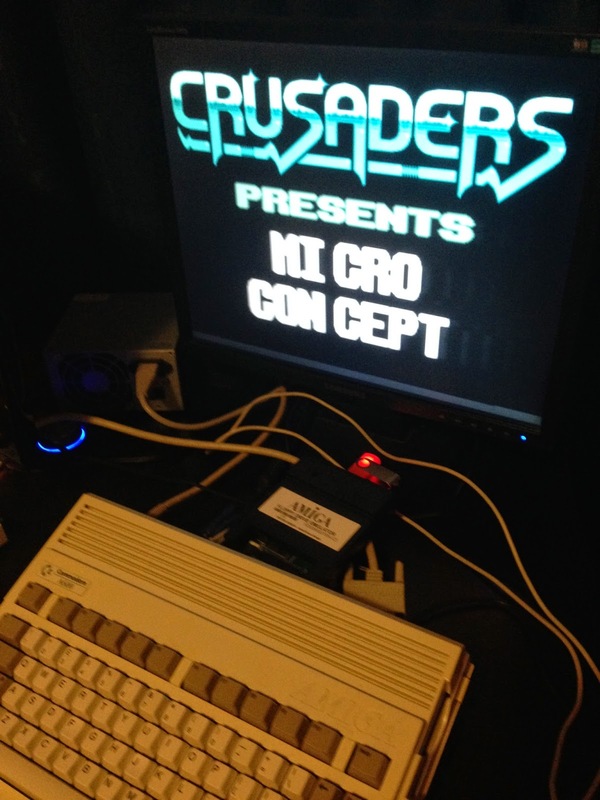 I do prefer the HxC though, and I will show the HxC on another occasion (I have one of these too) as I work through my Amiga 600 upgrade work. I first wanted to see what the Gotek was all about since I only found out about it recently. The price of the Gotek is initially attractive, but keep in mind the restrictions I mention above. If these are not an issue for you, then go for it! The Gotek unit from Chinese sellers costs less then 30USD including shipping. The USB cable for flashing the FW costs another 2$. $60 Australian dollars, not USD. 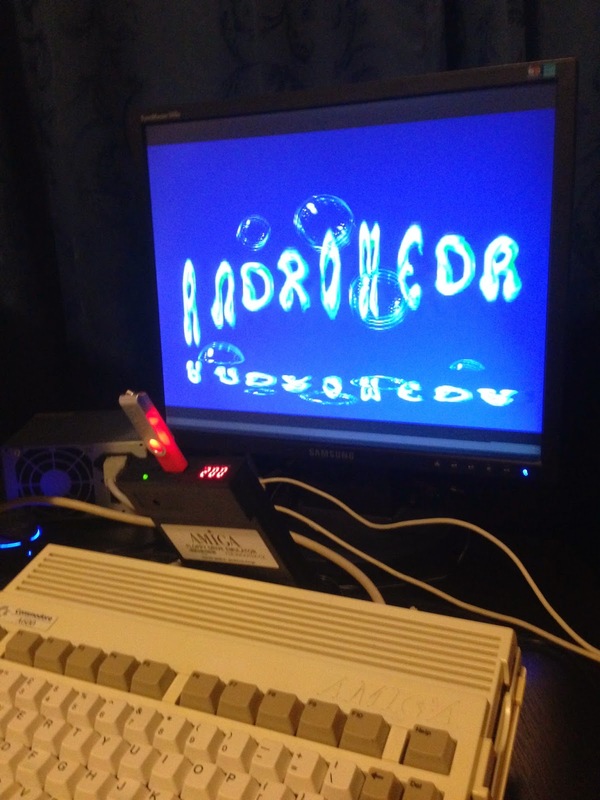 It may have cost more than the price you mentioned but I didn't have to do anything to get it working at all and it came with everything needed - Amiga firmware loaded, plug and go. For me I am happy with what I paid for it. If you can get it even cheaper now then that is great - well done!